The 2014 Alton Lions Easter Eggstravaganza was has been launched by Lion John Smith at Bushy Leaze with Lion President Sarah O’Donoghue and Lion Margaret Willoughby. 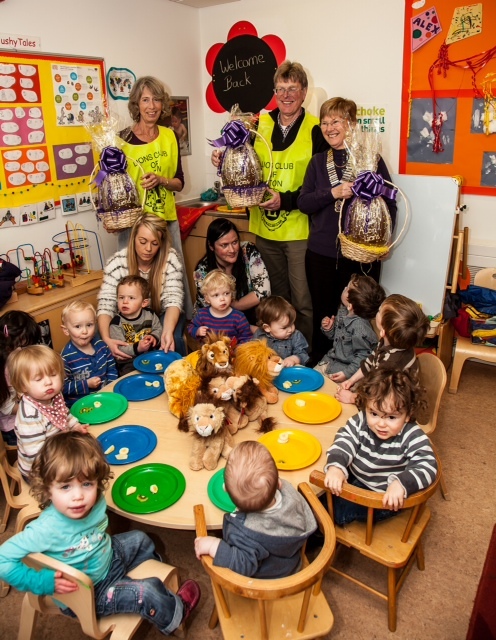 The project raises funds for Bushy Leaze Children and Family Centre by providing eggstra large chocolate Easter Eggs to outlets in Alton and local villages together with an un-named soft toy Lion. Players’ eggschange one pound to choose a name for the Lion and the winner collects an eggstremely tasty chocolate egg and an eggsquisite cuddly toy. Eggsuberant project leader John Smith said that the project has attracted eggsellent support from local pubs, clubs and businesses and he is looking forward to an eggceptionally good result. Bushy Leaze originated as a school for long stay children at Lord Mayor Treloar Hospital and transferred to its current location in Eastbrooke Road in 1996. It now is a nursery with some 60 children attending part time with fifty per cent of the places designated to children with learning difficulties and disabilities. Bushy Leaze also supports some 500 other children and operates a baby clinic. providing specialist education and care requirements for 3-5 year old children from Alton and East Hampshire. Previous Previous post: A Great Opportunity to Grow Your Club!